Just Press Record is the ultimate mobile audio recorder. Whether you want to capture ideas on the go or you’re a journalist conducting interviews, a student attending lectures, or a parent preserving your child’s first words, Just Press Record is a must-have app. With a single tap, the app seamlessly records, transcribes, and syncs audio to all your devices. No matter what you’re doing, Just Press Record is ready to capture audio. The app’s big, red record button makes starting a recording easy, but that’s just the tip of the iceberg. There’s also an iOS widget, 3D Touch functionality, an Apple Watch complication that works even when your iPhone isn’t with you, Siri shortcut support, a URL scheme, and a separate Mac app with menu bar and Touch Bar support, all ready to go when you need them. 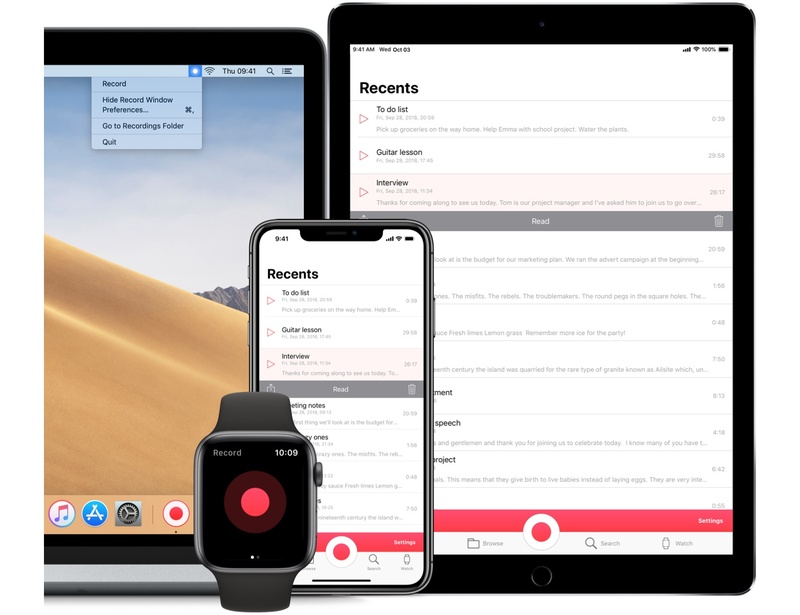 What makes Just Press Record feel like magic is its transcription, which can turn audio clips into editable text that you can share with other apps. Transcription also powers search, making it easy to find past recordings no matter how many you’ve created. Combine that with robust iCloud Drive sync, and your recordings and transcriptions are available everywhere you need them. Just Press Record has tons of other advanced features too. You can connect external microphones to create high-quality, uncompressed recordings. There is extensive VoiceOver support, which has made Just Press Record a favorite in the visually-impaired community. There’s even a beautiful dark mode for comfortable capture of your late-night ideas. Make audio capture your superpower by downloading Just Press Record from the App Store today. Our thanks to Just Press Record for sponsoring MacStories this week.